Mediation is an option for people, companies or other organizations to discuss issues with the help of an independent Person known as a mediator (a neutral person). It gives both parties the chance to talk and discuss the issues and to settle your dispute by reaching a solution without going to court. Mediation is VOLUNTARY so you can leave at any time if you wish to. If mediation does not work the option to go to court is still available. Mediation is a simple process for resolving disputes. Will it work for me and will mediation help me? Experience shows that where parties are getting divorced or are involved in serious disputes mediation has a high success rate. As a mediator I am there to help but it is up to the parties to develop their own agreement. Even if it seems impossible that the parties could ever agree amongst themselves mediation could provide the solution. Mediators are skilled and experienced as well as imaginative problem solvers whose job it is to reach a solution that parties are happy with. When it seems that there is little chance of resolving the dispute and the likelihood of going to court seems inevitable. When the costs involved seem daunting as well as the amount of time it will take to get to court and the amount of information that will be needed prior to going to court. The stress alone is reason enough to consider Mediation. There’s no argument that, when it comes to the current budget crisis and the bill under consideration to raise the debt ceiling, time is of the essence. And mediation is always the speediest way to help parties cut through the posturing, the politics and saber-rattling, to reach an agreement that will stick. Waiting to go to court often takes months. Mediation, on the other hand is an immediate solution that allows the parties to sit down quickly and start to find solutions before the problem becomes larger. The debt ceiling is a pressing problem, and one that needs to be resolved quickly, something mediation could handily do. The debt ceiling has proven to be a persistent point of contention and the parties continue to circle around the same topics and offer up the same solutions. In disputes like this, a mediator can often step in and help the parties think about the problems in new ways. Mediators don’t offer solutions, but they do guide the parties to look at the problem in a new way, thereby helping them develop alternative solutions. Having a non-invested, neutral third party in the room can change the tone of the conversation and make it more productive, thoughtful, and creative. It is also important to remember that a mediator does, in fact, mediate. That is, a mediator’s job is to keep the conversation on point and on target. In family mediation, elder care mediation, and business mediation, parties have a tendency to wander and to pull in topics, situations, and associated problems that are not helpful in resolving the issue on the table. A mediator guides the talks in a focused way, moving the parties from point to point, helping them move towards solutions and also helping them see the interrelation between the problems at hand so they can be solved in a cohesive manner. The mediation room is a positive space, where parties are not allowed to speak harshly and posturing is discouraged. Mediators work to keep parties focused on constructive conflict resolution rather than rehashing the past. In addition, mediation is a more private process, where parties are urged to keep the issues in the room. The privacy of the process can be helpful in resolving sensitive and complex conflicts where multiple agendas are at stake. By allowing parties to lay their cards on the table honestly and openly, they can ‘cut to the chase’ more quickly if they are not having to worry about the public perception of each position and argument presented. Mediation offers a multitude of benefits for settling conflicts – from marital squabbles, inter-family conflicts, business problems, to cross-border disputes. Maybe it’s time that the lawmakers in Washington try a new approach to ending the deadlock on the debt ceiling debate and bring a neutral into the room to help them move swiftly toward resolution. 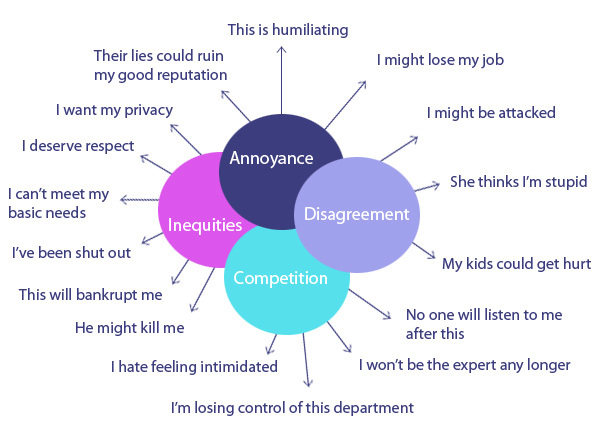 Conflict emerges when disagreements, differences, annoyances, competition or inequities threaten something important.